Another week (or so) down in my little gaming world. The week started off with Gruntsmith and I completing Gears of War: Judgement and to be honest it left me wanting…. Well just a little bit more. The game itself was fun and worth a play through, but doesn’t quite hold up to it’s predecessors. So after defeating the horde yet again, then mopping up a few extra achievements. 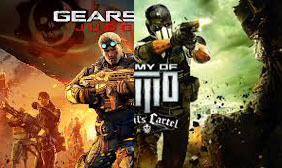 We were on to our next gaming chapter, Army of Two: The Devil’s Cartel… And it didn’t help that “wanting more” feeling either. After popping in the shiny new disc from Gamestop. I soon realized we were going to be in for a bumpy ride. We were quickly thrown into a world of a bland story, Cliché dialog and some of the buggiest gameplay I’ve experienced in a while. When we weren’t getting insulted with “yo mama” jokes, we were somehow falling through solid ground into the nether, and to our deaths. A lot of the interesting aspects from the previous titles in the series are lost on this installment. Maybe it’s hit one too many sequels or maybe just a rushed product. Either way it’s a lacking IP to say the least. The weapon, mask and player customizations are some of the few shining lights on this title. That included with the average FPS gameplay would bring this one right at about sub-par. So After rapping up the story mode with Gruntsmith. We added in an extra hour or two to grabbing the last few achievements we could, before the game was brought back to my retailer. Next up on the list will be Dead Space 3. Which i hope to get cracking on tonight. I also said i was going to be playing Catherine. Which i am actually excited to try, but just haven’t had the time to open the box. Until next time folks, Have a fun gaming weekend. ← Star Wars Land To A Galaxy Near You?